When it comes to sustainability, Berry authentically walks the talk. At Berry, sustainable design doesn’t simply mean sensitivity to the environment; we also consider all the other facets of sustainability—social, economic, aesthetic, and functional. Each of our projects incorporates energy-saving features, taking into account sun angles, wind patterns, passive and active solar heating options, and more. Through established channels, we source many local products and resources to reduce the costs and environmental impact of trucking and shipping. And we’re careful not to lose sight of the “embodied energy” of a project: the energy expelled when making products, which is often overlooked. Our staff are always up to date on the latest codes and strategies for reducing energy usage in the buildings we design. 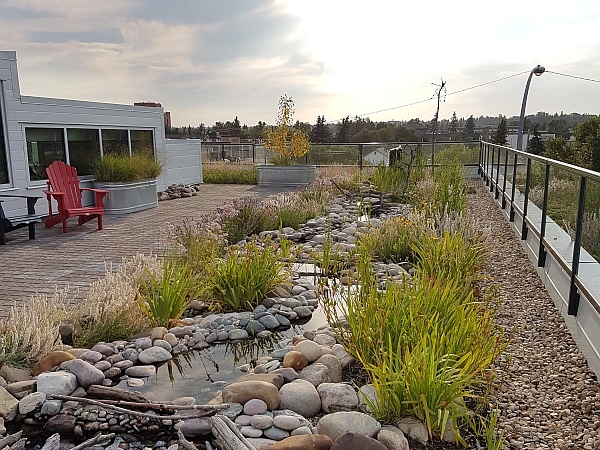 Our LEED Gold Certified office functions as a working showroom to display our creative approach to sustainable design—right up to our green roof, which won an international award. Beyond having tremendous benefits to the planet and the community, going green can yield substantial long-term operational savings. Our practised experts will gladly explain how these savings over your building’s lifecycle can offset the capital outlay required to achieve LEED standards—and ultimately boost your bottom line. When it comes to sustainability, Berry authentically walks the talk. In 2011, we completed the dynamic design and construction of our own LEED Gold office building, intentionally incorporating products and resources into our building first as a test to ensure that what we spec for you is sound from a sustainability point of view. The office building includes water reduction systems, high-efficiency lighting, and top-quality air-handling units and furnaces, all regularly serviced so they always operate at maximum efficiency. We also send our staff members to sustainability-related training sessions to keep them up to speed on practices that benefit the environment.